Woodbridge, VA- The Potomac Nationals will host Military Appreciation Night at Pfitzner Stadium to support their featured non-profit organization, Hope For the Warriors® on Sunday, June 23rd as the P-Nats host the Carolina Mudcats (Cleveland Indians) for a 6:05pm first pitch with gates opening at 5:00pm. The evening of all-encompassing gratitude to military members and the families of the great men and women of the United States armed services will feature family-friendly fun throughout the game leading up to a signature post-game fireworks show. The evening will honor and remember members of the American military for their courageous service to our country while raising funds for Hope For the Warriors®, a national non-profit organization that assists post 9/11 military service members, their families, and families of the fallen who have undergone physical and psychological wounds while in the line of duty. “We are very excited to be part of this event,” said Robin Kelleher, Hope For The Warriors® President. The Potomac Nationals Baseball Club is proud to partner with Hope For The Warriors® for the second year in a row as the beneficiary of Military Appreciation Night at Pfitzner Stadium. The initiative on this evening of baseball is to give back to active duty and retired military personnel and their families to show great appreciation for the noble service of the great men and women around the world who serve to protect the United States of America. “We are so proud to honor the service members who protect our country and their families. This is an exciting opportunity to continue our military community outreach through Military Appreciation Night at Pfitzner Stadium to benefit our featured non-profit organization, Hope For The Warriors®,” said Potomac Nationals Vice President/General Manager, Josh Olerud. 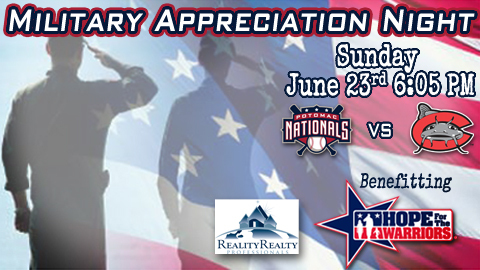 The Nationals look forward to embracing our local military community once again on this hallmark appreciation night with an entertaining night of P-Nats baseball, great food, family activities, an amazing fireworks extravaganza, and kids run the bases after the game. In addition to during Military Appreciation Night at Pfitzner Stadium, contributions can be made directly to Hope For The Warriors® at www.hopeforthewarriors.org. Hope For The Warriors® has earned a Four-Star Rating from Charity Navigator (www.charitynavigator.org) for two consecutive years. Charity Navigator is an independent organization that evaluates fiscal responsibility and accountability of non-profits. The Potomac Nationals of the Carolina League play at Pfitzner Stadium in Woodbridge, Virginia, and are the Class-A Advanced affiliate of the Washington Nationals. P-Nats 2013 season tickets, mini plans, and individual game tickets are on sale now. Sponsorship opportunities for the ’13 season are still available. Plan your corporate outing now in preparation for the summer months as the P-Nats offer discounted group rates and all-inclusive picnic options. Visit the P-Nats online at www.potomacnationals.com or call the ticket office at 703-590-2311 for more! This article originally appeared on the official website of the Potomac Nationals. Click here to view the original story.